We make hundreds of decisions on projects. Every day, we’re expected to take some action and that inevitably means making a decision about something. Why is Decision Making Difficult? It might be something small like whether or not to call a meeting. Or it might be something substantive like whether to escalate an issue to your sponsor. Get a free decision log template to help you track the decisions you make. Sign up for our newsletter & receive the file via email. Decision making is a key skill. But what do we mean by ‘decision making’? Decision making is the ability to select an option from a range of choices. And, hopefully, choosing the best next step for whatever situation you happen to be in at the time. It might seem simple to define, but many people find decision making at work quite difficult. You’re worried about choosing the wrong option. Don’t worry about that last point. If it’s bothering you, read why I think there’s no such thing as a bad decision. Something you can do to make decision making easier is to have a process for it. A process helps you step through the different options to give yourself confidence that you’ve covered all the angles and are ready to make the decision. The decision making process is the main tool for making decisions. I haven’t come across ‘tools’ where you can plug in all the data and out pops the decision you should make. I think humans are key to making the right call, so it’s hard to use tools to do that job. Identify that you need to make a decision – this might seem like a silly step to have, but identifying that a decision needs to be taken is honestly the first step in taking action! Gather the data. What information do you need to be able to take the next step? Get the stats or talk to people who can help inform you. Assess the options. There are likely to be several, including ‘do nothing’ which is always an option and can be a conscious choice. Choose an option. This is the decision. Make the call. Just do it! Follow through. Take the necessary steps to turn your decision into action. For example, if you decided to delay your project by two weeks, update everyone on the team with that information and review your project schedule. That’s the main decision making model, but there is another useful step you can take. After a while, review the decision and see whether – with hindsight – you are still happy with the call you made. Being reflective about decisions can help you make better choices next time. 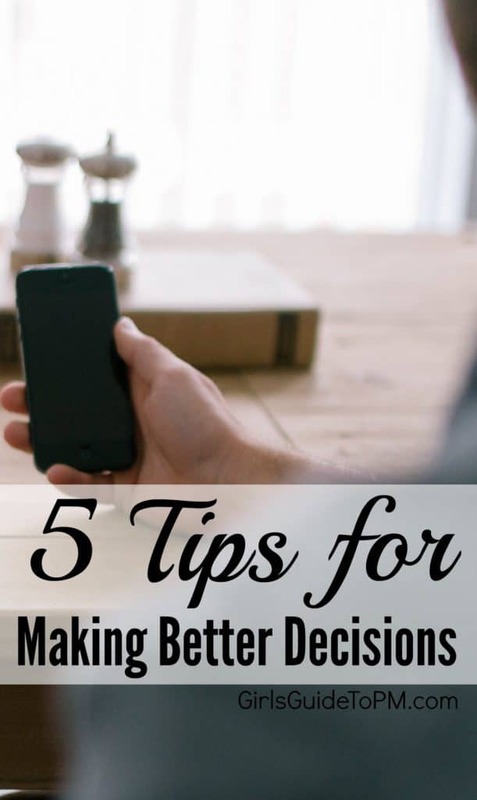 And talking of making better choices… here are 5 simple suggestions for how to make better decisions. You can improve your decision making. The more you do it, the more confident you’ll get. But you can also tweak how you approach decision making to give yourself a better chance of a good outcome. Making a decision under a lot of time pressure is one of easiest ways to get trapped into getting it wrong. Even if you thrive under pressure, a few minutes of quiet time to consider the data and the options is going to help you make the right choice. If you can, sleep on your decision and see if you still feel the same way in the morning. There are very few situations you will come across in your career where you’ll need to make a snap decision without being able to think it over. Most people will be open to the idea that you want to review the facts before making a pronouncement, so if you need extra time, ask for it (if, indeed you need to ask anyone at all). Decision making is important in business because the decisions made lead to financial implications for the organisation. So you decide to recommend a risk mitigation strategy? That’s costing the business something, whether it’s time or resource. As the implications for business can be significant, it’s important decisions are the right ones. And that can be helped by getting all the facts. If you don’t have the facts, you’re guessing at what the right outcome should be, and frankly you’re relying on luck to get you through. “I’ve been lucky” is not something you want to write on your resume. Talk to people. Look at the data. Use your own judgement. Dig deeper. Decisions are easier when you know the facts – often the right choice pops to the surface as it’s obvious. Think about the natural consequences of your decision. This can help you frame what needs to happen next – is it really what you want? For example, will your decision lead to more decisions on how to resource or pay for your chosen course of action? You might need to get other people to weigh in here, as it’s often easier to draw on the wisdom of crowds to think through the logical next steps. Use the experts in your team. While the decision might be yours to make, it doesn’t hurt to get a second or third (or more) opinion. In fact, someone who is a bit more removed from the problem than you are can bring perspective that you don’t have. If you need to involve a group in coming together to make a collective decision, then read How to Help Teams Make Group Decisions. 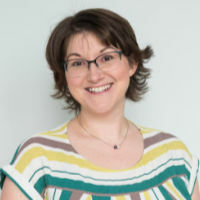 If you don’t want to be seen getting input from the team — and there may be situations where that isn’t possible, like an HR issue, for example — then talk to your mentor or a trusted manager. Your decision making process might not work for every decision, so be prepared to flex your approach to suit the situation. Not every decision you need to make will require the same thought process, so you need to be sure to adopt a flexible approach which allows you to adapt your ideas to the situation. If you work in project management, it’s a world which requires you to be flexible anyway so you should soon get into the habit of being flexible. You should approach each decision in the way which best suits it. Personally I like to make out a list of the strengths and weaknesses of each potential decision but I know that this isn’t necessarily the best approach in every single case. 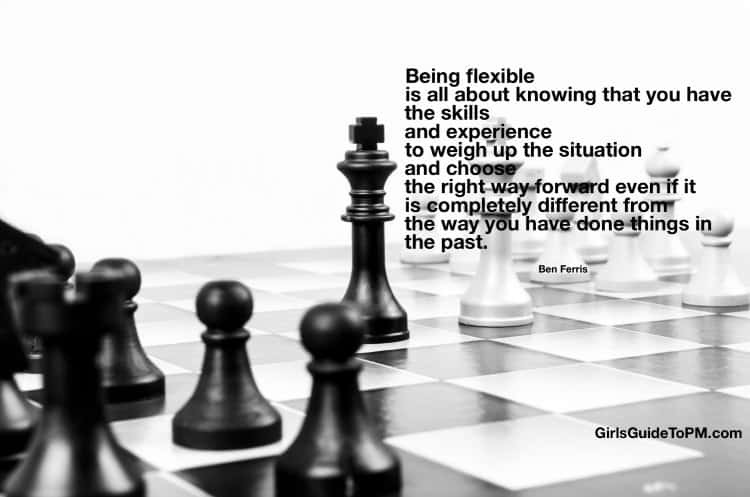 Being flexible is all about knowing that you have the skills and experience to weigh up the situation and choose the right way forward even if it is completely different from the way you have done things in the past. Ethics: decision making ethics are so important. You have to consider what’s right for the people, the project, the business and more generally, what’s the ethical thing to do. Decision making is such a crucial skill for business leaders and project managers. Hopefully the tips in this article will help you make great choices at work. space to cope with hectic project schedules and work. Decisions often cause stress, but they don’t need to. I find that if you are not 100% convinced of the decision you are making then it is far more stressful to implement than if you believe in what you are doing. I appreciate the emphasis on allowing yourself time and flexible approaches to decision making. I often find I need different environments as well depending on the level of outside opinions I may or may need have a need for. Nicole, yes that helps me too. It’s hard to make work decisions at work sometimes – it helps to come home and make the final decision while washing up or cooking, as the extra time and the distance from the pressure of the office helps organise my thoughts.